Thai Square restaurants use authentic ingredients that are flown in from Thailand on a daily basis, that are then used to create a range of exquisite dishes. The appeal of Thai cuisine lies in fresh flavours and in featuring some dishes that have a kick of chilli. Diners wanting a less spicy flavour can request this when ordering. Thai Square Trafalgar Square is an opulent restaurant that serves Thai food that is bursting with flavour. Relax in stylish and laid-back surroundings and enjoy the unforgettable dining experience. This central location of the Thai Square chain is a stylish restaurant that serves a tasty Thai cuisine. It is an ideal destination for a working lunch or for a relaxing meal after a hard days work. This Islington location of the Thai Square chain is particularly inviting and offers the sumptuous and reasonably priced food Thai Square regulars have been accustomed to. With a contemporary interior and informed and helpful staff, this Thai Square is a must. 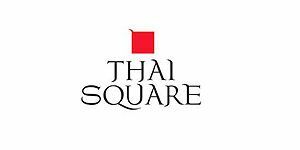 Thai Square Hanover Square is in the perfect location for all those avid shoppers out there. It offers beautifully prepared Thai dishes to tuck into before, during or after a hectic shopping trip. Sit and relax within stylish and welcoming surroundings and put your feet up. Thai Square Putney Bridge is an inviting restaurant with gorgeous views over the Thames. It offers a wide range of delicious dishes that tantalise your taste buds, the food combined with the stylish decor and friendly staff add to the delectable dining experience. If you enjoy laid-back dining, scrumptious Thai dishes and stylish décor to enjoy it all in then, head for Thai Square the Strand. This winning combination will get you going back for more. This South Kensington location of the Thai Square chain is close to the London museums and offers sumptuous and flavoursome Thai food. With a contemporary interior and friendly staff your dining experience will one to remember. Take pleasure in indulging in some delicious Thai dishes at Thai Square Mansion House. It offers an extensive menu along with excellent service and a warm and friendly atmosphere. This Richmond location of the Thai Square chain is particularly inviting and offers the sumptuous and reasonably priced food Thai Square regulars have been accustomed to. With a contemporary interior and informed and helpful staff, this Thai Square is a must. Indulge in fabulous Thai cuisine at the sleek and stylish Thai Square Covent Garden. Offering a sumptuous menu bursting with authentic and truly beautiful dishes makes it an ideal destination for all. Thai Square Wig and Pen is a well-established restaurant that serves imaginative Thai dishes within a stylish setting. Thai Square is situated opposite Windsor castle and as you can imagine the views are amazing. Sit in stylish surroundings and enjoy the wide range of tasty Thai dishes on offer. Thai Square Fulham is located in the heart of busy Fulham Broadway. This stylish restaurant offers authentic Thai dishes which are freshly made with ingredients flown in daily from Thailand.